Stearns’ Regulatory Compliance Guidebook For Cleaning Organizations is an unbelievable tool for companies striving to attain CIMS & CIMS-GB certification. 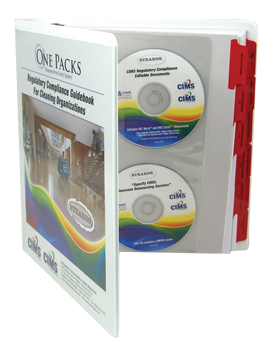 This binder is a roadmap to compliance for many sections of the CIMS & CIMS-GB Standard. Including everything from Hazard Communication to Workplace Safety & Health, this binder provides a “CIMS Regulatory Compliance Editable Documents” CD that enables you to customize your documents on-screen for CIMS & CIMS-GB Certification.